The Coalition to Save Manned Space Exploration: China is Going to the Moon. Will We? China is Going to the Moon. Will We? The successful Chinese manned mission to their Tiangong-1 docking target/mini space station shows their space program is well funded and well planned. They are not standing still or waiting for us to get our act together. This is a brief review of China's plans for the future, and the lessons the US must learn, lest we are left behind as they, not we, conquer and explore deep space. 2013 Launch of Tiangong-2, a larger module than -1, which will be used for additional manned missions. 2015 Launch of Tiangong-3. This will be the first module of their Mir-sized space station. 2017 Chang'e-5 lunar soil return mission. 2020 Completion of their Mir-sized space station--the earliest date ISS may be retired and destroyed. Unless Bigelow is successful with his inflatable space stations, China's might become the only major space station in the next decade. 2025 Manned landing on the moon, then establishment of a permanent moon base. Newt Gingrich was mocked in the media for proposing what the Chinese are now working towards. Future: Discussions of not just Mars, but Saturn! Nobody in the US is even talking about manned missions to Saturn's orbit and moons; what's wrong with us? China has released some information about their heavy-lift moon rocket, now under development. It will be a Saturn V/SLS class rocket, in the range of 100-130 metric tons. Not surprisingly, this size has been the consistent recommendation for moon and deep space missions from Wernher von Braun's plans up to SLS. Indeed, Saturn V only carried three astronauts, a capsule and a lander to the moon. Adjectives such as "monster" are often given to SLS by the media, yet this size is what is needed for such missions without more risky and complex orbital assembly of smaller components on multiple launches. Beyond the technical aspects, it is vital that US decision makers and candidates understand the political and strategic aspects of China's accelerating space program. The lesson for the US is that if we don't complete and create real missions for SLS--our moon/Mars rocket; China may become the only nation capable of building a moon base, going to asteroids, and venturing to Mars. It would be China, not the US, which would reap the benefits of manned space exploration. It is important to understand that China's space program is not civilian, but is run by their military. A serious mistake is to assume China's government is peaceful, democratic and benevolent. Therefore their purposes and ambitions may not be limited to merely peaceful scientific pursuit. Their space stations may have dual military/civilian purposes, and their intentions in space may reach beyond the peaceful. Can China be trusted to not seize the high frontier? What could a Chinese flag on the moon mean? These are not merely academic or alarmist questions, for the Chinese flags planted on the South China Sea bed announced they are trying to seize the sea; and their belligerent actions and statements indicate they could go to war to conquer the sea. Actions speak greater than words; and at best, China is not setting an example on earth by which we could trust that their actions in space would be any different. Could their manned space program have a goal to facilitate Chinese military control of orbital space, particularly once ISS is destroyed in 2020 or 2028? 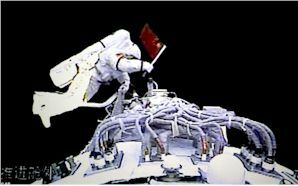 Would a Chinese flag on the moon mean what ours did, "we came in peace for all mankind," or would it mean what it does on the South China Sea bed? Even if there is no overt militaristic threat, the Chinese are experts in the many subtle forms of hegemony, and as their military and economic might grows, mere hints or comments can be perceived as threats. The answer for the US is to simply go forward with our space program and go to the moon, asteroids and Mars; and thereby not award by default deep space to possible Chinese claims. Cooperation is theft. China's long history of technological and intellectual property theft, coupled with their fresh appeal for cooperation with the West on space should be of serious concern. Any space cooperation with the US or Europe could lead to them gaining and exploiting our most advanced technology, utilizing it for military purposes, and cutting us out of any deals before the payoff. Representative Frank Wolf (R-VA) succeeded in passing language which currently blocks such cooperation, and it must be continued. The intangible but real and powerful benefits from a bold space program: national pride and international respect. America needs positive, awe-inspiring accomplishments for this generation. Americans felt good about our nation when we landed on the moon; it helped unite us and inspire us to greater heights--we need something like that again. International respect and national pride are never built by statements and promises, but by big, bold exciting actions. The world's image of China--beyond their tyrannical and militaristic actions--generally includes their economic progress and their infrastructure; and now their space program will gain international attention and respect. The Chinese Bay Bridge in San Francisco is a daily reminder to area residents of who has the power today. They understand this point well. No doubt when American presidents negotiated with other nations in the Apollo era, our accomplishments in space and other fields induced enough awe that we probably won concessions we wouldn't have otherwise. America will find we have greater international respect when we again do bold and exciting things. "China’s capabilities pose a security threat to the US by enhancing Chinese military systems while threatening to disrupt or disable US space systems in a conflict. "China’s space ambitions are in part peaceful in nature. Yet technologies can also be used with ill-intent." Conclusion: China's rise in space is an economic and strategic challenge to the US if we let them fill a vacuum from our inaction. If we continue cutting our space program and delay continually returning to the moon, visiting an asteroid, and taking that historic first step on Mars; then we award them a competitive advantage which could indeed help make the 21st century be a "Chinese century." The investments, jobs, innovations and national pride will all go to China to our disadvantage. Let's make sure that the 21st century is an "American century."